Perfect for the young, up and coming steer roper! Steel stand for junior steer head is 27” long and 14” tall. The stand is collapsible into four pieces for easy transporting and storing. 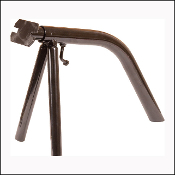 Designed for use with the Junior Steer Head or Calf Head. Made by Mustang Manufacturing, all steel construction and includes hardware to mount head (head not included). Neck swivels allowing you to practice roping "head ducking" cattle. This item is also available on our site as a combo with the Junior Steer Head or calf head!